Water, barley, hops, and yeast… Right? That’s the basics, but how much, when, for how long, and why? Make beer with me in a 3-hour hands-on workshop. Together we’ll go through the whole process of all-grain brewing on your stovetop, even all the way to bottling beer yourself. Everyone gets to take home a few bottles. Of course, we’ll be doing a lot of beer tasting, just to be sure we get our recipe right. In this workshop we’ll be making my favorite Fall beer, an American Wheat Ale with Rye. Come thirsty… for knowledge! Homework: all students must bring a bottle of their favorite wheat beer to share! This entry was posted in Workshops on November 12, 2015 by gilbert. Learn to make your own beer in this 3 hour workshop. You’ll go through the whole process of all-grain brewing on your stovetop, even all the way to bottling beer yourself. And everyone gets to take home a few bottles. Of course we’ll be doing a lot of beer tasting, just to be sure we get our recipe right. In this workshop We’ll be making a deliciously hoppy IPA. Come thirsty… for knowledge! This entry was posted in Events, News, Workshops on June 9, 2015 by gilbert. “Preserve the Summer” is a collaboration beer created by Temescal Homebrewing and Preserved. Preserved is Oakland’s one-stop popup shop for DIY preserving and fermenting supplies. The beer is a rustic Saison and part of a new stovetop brewing kit that also includes instructions on how to take it a step further and make a Sour Saison using wild Lactobacillus to create a sour mash. We’ll have kits at the workshop this Saturday or stop by Preserved to pick one up. Learn how to brew an all-grain one gallon batch of beer on your stovetop this weekend at Preserved. I’ll be teaching a three-hour workshop where we’ll be focusing on how to make a Saison, the perfect beer to kick off your Summer. Everyone goes home with as much beer as they can bottle and we’ll be tasting examples of the style, first thing, at 10 am! This entry was posted in Events, News, Workshops on April 9, 2015 by gilbert. I will now be selling kits and teaching workshops at Preserved, a new popup shop in Oakland that features supplies and workshops for DIY canning, fermenting, cheese-making, brewing, and herbal medicine. The grand opening party is this Saturday! Don’t miss it! Exposed at Other Cinema–Saturday, 3/14! Learn to make your own beer in this 3 hour workshop. I’ll show you the whole process of all-grain brewing on your stovetop, even all the way to bottling beer. Any beer you bottle, you can take home! And of course we’ll be doing a lot of beer tasting, just to be sure we get our recipe right. We’ll be making a deliciously hoppy IPA. Come thirsty… for knowledge! This entry was posted in Events, News, Workshops on March 4, 2015 by gilbert. Stovetop Brewing Kits on Etsy! Where can you get the best beer in the world? In your kitchen! But how can that be? My stovetop brewing kits are now on Etsy! They come in two colors: Stout and Rye Wheat Ale. And one size fits all! You, or someone you would love to make you beer, can learn to make a 1 gallon batch of delicious, fresh, homemade beer. This kit makes it almost as easy to make it as it is to drink it! If you’re local, get in touch to make a purchase and get free delivery! This entry was posted in News on December 12, 2014 by gilbert. Celebrate the Fall Harvest at Biofuel Oasis today from Noon – 5pm! I’ll have two harvest beers there for tasting: Blackberry Rye Wheat and Fresh Hop Rye IPA. The Blackberry Rye Wheat was made with fresh blackberries grown on a wild bush in my backyard. The Fresh Hop Rye IPA was made with Cascade hops also grown in my backyard and caramel malt that I roasted at home. This entry was posted in Events, News, Workshops on September 27, 2014 by gilbert. I was actually looking for something closer to “teach a man to fish” when I found this quote by Papazian. 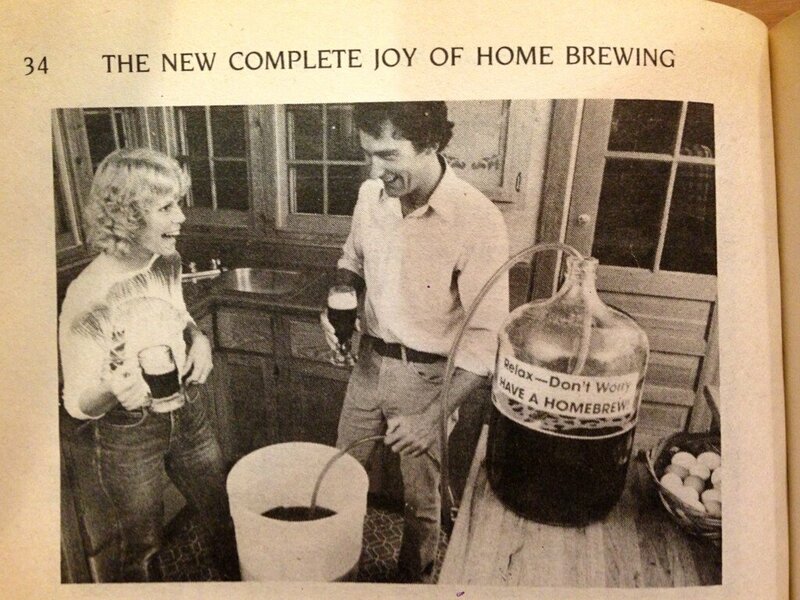 Oh well… It’s time to announce another homebrewing workshop! This entry was posted in Events, Workshops on December 23, 2013 by gilbert. 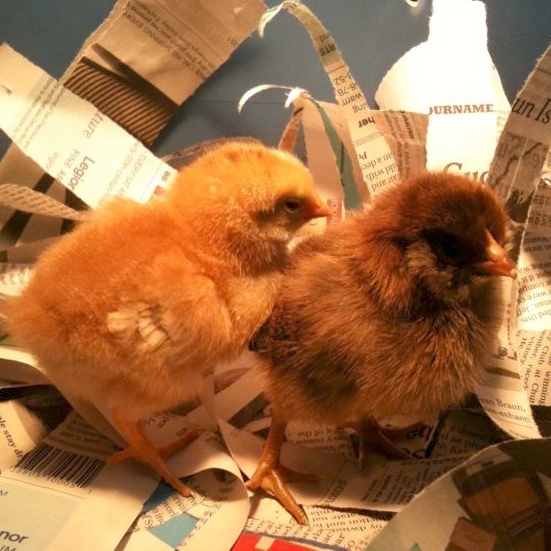 Our chickens when they were just little chicks. So cute! Today, my favorite local urban farm store Biofuel Oasis is having their 10th anniversary celebration. We bought our chickens when they were two days old there and we buy all of our chicken feed there–50lb. bags of organic layer pellets! Also, they’re hosting one of my workshops in January: Stovetop Brewing! Tomorrow, I’ll be at Shapeshifters Cinema at the Temescal Art Center in Oakland with my Hoppy Holidays Oakland Steam Beer. This entry was posted in News on December 7, 2013 by gilbert.